Today’s tutorial is a hairstyle from my book, DIY Updos, Knots & Twists. I’ve never shared a hairstyle from this book but this one is my very favorite. In the book, I did the style on my sister and have been wanting to try it on myself ever since. Step 2 / Divide out a section of hair at the crown, from the part down to the left ear, and clip this away. Step 3 / Combine the bottom hair together and tie it into a ponytail near the nape of my neck. Step 4 / Take a clear elastic band and slide two bobby pins on opposite ends of the elastic. Step 5 / Bring the ponytail up and slide one bobby pin into the hair under the ponytail, lay the elastic band over ponytail hair, and then slide the other bobby pin into the hair on the opposite side, underneath the ponytail. Step 6 / Take a hair cushion and place this over elastic band of the ponytail. Step 7 / Slide bobby pins around the edges to hold it in place. Step 8 / Smooth the tail of the ponytail over the cushion and tuck the ends underneath. Step 9 / Slide a bobby pin underneath the cushion to pin the ends in place. Step 10 / Let down the top section of hair and brush it over the right side of the bun. Step 11 / Starting on the left side, roll the hair upwards, creating a twist over the top of the bun. Step 12 / Continue the twist until all of the hair is combined and then wrap the twist around the right side of the bun, underneath, and up the left side. Step 13 / Pin down the end of the twist before sliding bobby pins around the rest of the twist to hold it in place. Step 14 / Once it’s all pinned, go back over the twist and gently pull on the edges to make it a little fuller. Step 15 / Spray the style with hairspray and smooth down flyaways. 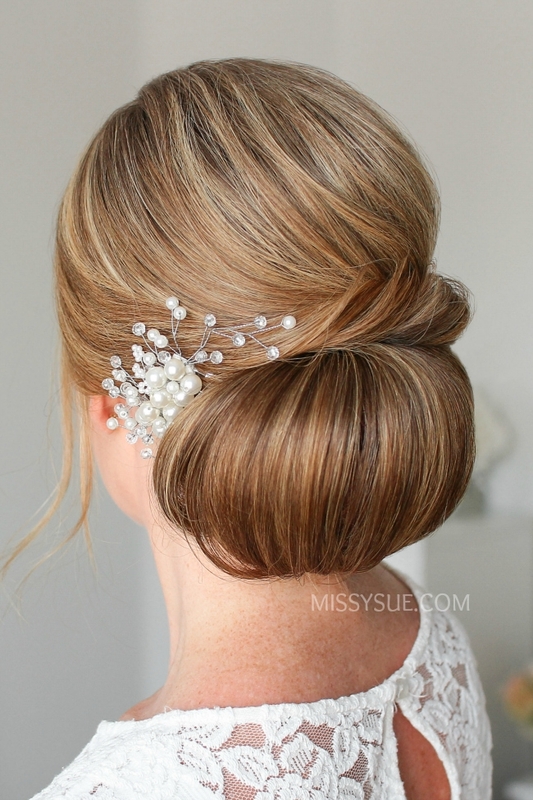 Step 16 / Finish the style by adding an accessory on the left side of the bun. I love wearing half up fishtail french braids so I thought it’d be fun to try out with two braids on one side. There were two things I struggled with when creating this style. The first was deciding how large to make each section for the two braids on the left side. It’s important they are similar in size but not too far back on the head that you get a bump at the top when pinning them in place. The other struggle was making sure the braids didn’t look too messy once they were pinned next to each other. For that, I made sure to spray them with hairspray and smooth down any fly-aways before and after pinning them in place. To prep my hair for this style, I curled small sections away from my face with a 1 1/4″ curling iron. Step 2 / Divide out a section of hair on the left side, about 3 inches back from the hairline and clip away the forward hair. Step 3 / Take a small slice of hair near the part and divide it into three sections. Step 4 / Begin a regular braid by crossing the right strand over the middle, then the left strand over the middle. Step 5 / Combine the middle and right strand together so there are two sections. Step 6 / Take a small piece from the right side and cross it over to the left, pick up a new section of hair and cross it over to the left side. Step 7 / Then take a small piece from the left side, cross it over to the right, pick up a new section of hair and cross it over to the right side. Step 8 / Repeat steps 6 and 7, crossing small sections from one side over to the opposite side while adding in new sections until the braid reaches the left temple. Step 9 / Now stop adding in hair to the bottom side of the braid and only bring in hair to the top of the braid until it reaches the back of the head. Step 10 / Braid the section a little further down and cross a bobby pin over the bottom so it doesn’t unravel. Step 11 / Let down the front section of hair that was previously clipped away and repeat steps 6-10. 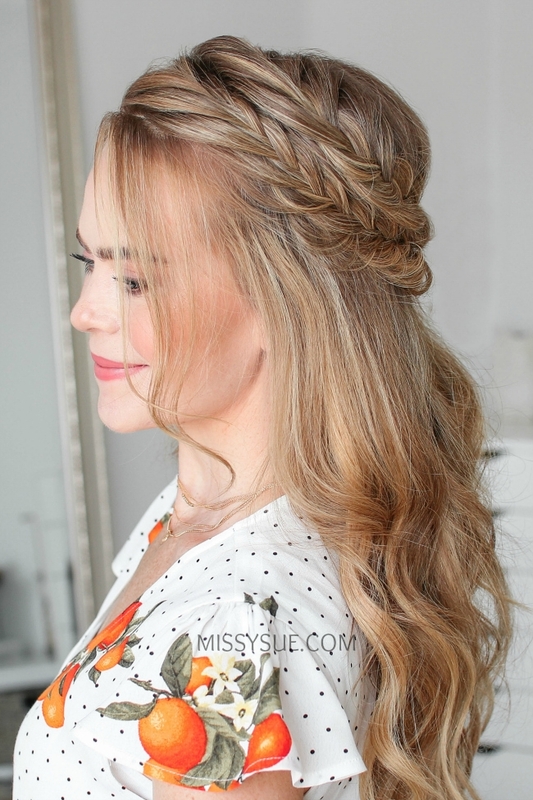 Step 12 / Now create a third fishtail french braid with the hair on the right side of the head, adding in hair until the braid reaches a little above the right ear and then continue the braid a little further down before sliding a bobby pin over the ends. Step 13 / Take the right braid and create a gap about halfway down the braid. Step 14 / Pull the back, left braid through the gap. Step 15 / Pin both braids against the head with bobby pins. Step 16 / Gently pull on the edges of the braids to make them a little bit fuller. Step 17 / Then remove the bobby pins from the ends of the braids and brush through them. Step 18 / Take the forward, left braid and gently pull on the edges to make it a little fuller. Step 19 / Lay it underneath the previous two braids and pin it in place with bobby pins. Step 20 / Set the style with a medium-hold hairspray. We recently moved! I thought it would be fun to sit down and film a little “Get Ready With Me” video and share what’s new with me and my family. I also asked on instagram to share any questions you have so I could incorporate them into this video as well. Step 1 / Begin by parting the hair in a deep side part on the right side. Step 2 / Divide out a 1.5″ section of hair on the heavy side of the part near the hairline and clip down the back hair. Step 3 / Pick up a section of hair near the part and divide it into three pieces for the braid. Step 4 / Start b crossing the right strand over the middle, then the left strand over the middle. Step 5 / Cross the right strand over the middle, pick up a new section and cross it over and into the middle strand. Step 6 / Then cross the left strand over the middle and bring a new section into the braid. Step 7 / Now cross the right strand over the middle but don’t add in a new section on this side. Step 8 / Then cross the left strand over the middle, pick up a new section and cross it over and into the middle strand. Step 9 / Repeat those steps continuing the lace braid, only adding in hair on the left side of the braid until it reaches the left temple. Step 10 / Now braid the rest of the section to the bottom and tie off the end with a clear elastic band. Step 11 / Let down the hair that was clipped back and divide out a second section for the second braid. Step 12 / Repeat the same steps creating a second lace braid, bringing in hair to the left side of the braid and then tying off the bottom with another elastic band. Step 13 / Once both braids are done, bring the rest of the hair up into a high ponytail, adding the braids in last and tie it all together with a hair band. Step 14 / Remove the elastic bands from the ends of the braids and brush through them. Step 15 / Take small sections of the ponytail and create loops, pinning them in place with bobby pins around the hair band. Step 16 / Continue creating loops, pinning down the ends wherever there are gaps in the bun and place a few on top of the bun to create dimension. Tip: As you’re pinning the sections, make sure to check in the mirror so the bun stays symmetrical. Step 17 / Go back over the sections of the bun and smooth down any flyaways with hairspray. Step 2 / Pick up a section of hair on the heavy side of the part and divide it into two sections. Step 3 / Cross the left strand over the right strand. Step 4 / Add a new section of hair into both sides, twist both sections towards the face and cross the left strand over the right strand. Step 5 / Now add a new section of hair to both strands, twist them towards the face and cross the left strand over the right one. Step 6 / Repeat those steps until hair is brought in above the left ear. Step 7 / Now continue twisting the sections together until it reaches the end of the hair. Step 8 / Cross a bobby pin over the bottom so it doesn’t unravel. Step 9 / Bring all of the hair together into a ponytail and tie it off with a hair band. Step 10 / Now go back over the braid and pull on the edges to make it bigger so it’ll show up better. Step 11 / Then remove the bobby pin from the end of the braid and unravel it. Step 12 / Take a section of hair form the ponytail, wrap it around the hair band and pin it underneath with a bobby pin. Step 13 / As an extra step, tie a hair scarf over the ponytail.